– The ideal height is between 9 and 10½ inches. Today the Havanese is bred primarily as a family companion. He is a happy, outgoing, pleasant and affectionate little dog that is also exceptionally bright and easily trained. He is very devoted to his family and loves children. Even though the Havanese is classified as a Toy breed, this is not a tiny, fragile dog, but rather robust, muscular and very athletic with great stamina. Most Havanese take naturally to the water and love to swim. They also do very well in Agility. In appearance, the Havanese has a unique lively, elegant, springy gait which gives the impression of agility. His expression is mischievous and intelligent with large, dark, almond-shaped eyes. The Havanese’s coat is non-shedding, long, soft and wispy with curls at the ends. He comes in white, cream, champagne, gold, blue, black, silver, chocolate, or any combination of these colours. The coat is profuse but extremely light and soft which was the reason for the breed’s original names: Havana Silk Dog or Spanish Silk Poodle. Although the coat is very warm looking, it developed as a barrier from the tropical sun and overheating. The Havanese is a member of the Bichon family. The breed originated in the Western Mediterranean region and developed along the Spanish and Italian coastal regions. It is believed that the Havenese’s ancestors were brought to Cuba aboard trade ships sailing from the island of Tenerife. The Havanese is the National Dog of Cuba and its only native breed. By the mid-eighteenth century the breed was popular in Europe and type was well established. With the Cuban revolution, those Cubans who owned Havanese were among the first to leave the country and with that, a few dogs ended up in the United States. By the 1970s, the gene pool was being rebuilt and today, all Havanese, except those who remained in Cuba, stem from 11 immigrant dogs. The Havanese’s traditional role was that of a family companion, playmate, watchdog and herder of poultry. Cataracts — In the Havanese, cataracts can develop at any age, can cause blindness or grow slowly and never progress to blindness. Cataracts can appear in different locations within the lens as well as affect one or both eyes. The Havanese Club of America highly recommends annual eye examinations. Chondrodysplasia — Chondrodysplasia or CD, meaning faulty cartilage, can manifest in various ways. The most recognisable effect is “Dwarfism.” A disorder of the bone which may result in premature closure of the growth plates. This can be either mild or moderate and not easily seen or it can be severe. In addition, while some dogs affected with CD may have straight short legs, others may have one or both legs bowed. Chondrodysplasia has many syndromes and Dwarfism is only one. Other abnormalities can include cataracts, as well as liver and heart defects. 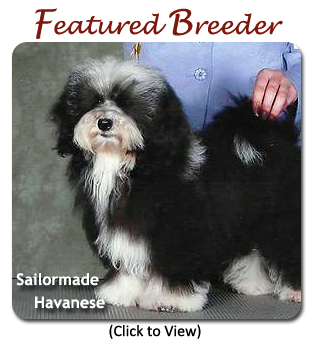 For more information on CD, see the Havanese Health Issues section of the Havanese Club of America website. Heart Disease — Mitral Valve insufficiency has been confirmed in the Havanese breed. Deafness — Both bilateral (complete) and unilateral (partial) deafness has been found in the Havanese. At this time, the mode of inheritance is unknown. It should also be noted that the Havanese may have a heightened sensitivity to certain Anesthetics and may require reduced levels. In addition to general anesthesia, some Havanese may be hypersensitive to pre-anesthetic sedatives. For further information on this important topic, please see: Anesthetic Reactions from the Havanese ABCs. Canine Health Information Center (CHIC) — Havanese Breed Requirements — Providing a source of health information for owners, breeders, and scientists that will assist in breeding healthy dogs. CHIC is a centralized canine health database jointly sponsored by the AKC/Canine Health Foundation (AKC/CHF) and the Orthopedic Foundation for Animals (OFA). Have a Hav? Or Just Considering One? — A comprehensive Havanese FAQ to help you decide if a Hav might be the right dog for you and your family. Havanese ABC’s — Excellent resource for information about the Havanese.